Harry Houdini was born on March 24, 1874 in Budpest, Hungary, with the name of Ehrich Weisz. He was one of six children and the son of Rabbi Mayer Weisz and his second wife, Cecilia Steiner. In 1876, Mayer Weisz immigrated to the United States with the dream of a better life. He found work as a rabbi and changed his last name to Weiss. In 1876, the remainder of the family joined him in the United States. The family moved to Milwaukee when Ehrich was eight years old. During his early years, Ehrich sold newspapers and shined shoes to help support the family. On October 28, 1883, nine year old Ehrich made his first appearance on stage, performing a trapeze act. He billed himself, "Ehrich, the Prince of the Air." At 12, Ehrich hopped a freight car and ran away from home. A year later her returned to New York and continued to help support his family by working as a messenger, necktie cutter, and photography assistant. Nothing is known of his year away from his family. About this time, Ehrich and his brother Theo began to pursue an interest in magic. As a stage name, Ehrich Weiss became Harry Houdini by adding an ìiî to the last name of his idol, French magician Robert Houdin. Harry is simply an Americanized version of his nickname, Ehrie. At 17, Ehrich, now known as Harry Houdini, left his family to pursue his magic career. By the age of twenty, Harry had been performing small acts throughout New York. He soon married and joined a circus where he began to develop and perfect his escape tricks. Through the years, Houdini gained fame after repeatedly escaping from police handcuffs and jails. Harry was even given certificates from various wardens for escaping from their prisons. After making his name in America, Harry toured Europe, where he expanded his repertoire by escaping from straitjackets and coffins. Eventually, Harry was able to accomplish his dream of having a full show dedicated to his magic. In his later years, Harry took his talent to the film arena, where he both acted and started his own film laboratory called The Film Development Corporation. Years later, Harry would receive a star on the Hollywood Walk of Fame. In addition, Harry showed interest in the field of aviation and was the first person to ever fly over Australian soil. In the 1920s, Harry became interested in the occult, specifically in debunking mediums and psychics. His training in magic helped him expose frauds that scientists and academics could not. He chronicled his time investigating the occult in his book, A Magician Among the Spirits. In 1926 Houdini died as a result of a ruptured appendix, after suffering a blow to the abdomen by university student J. Gordon Whitehead. 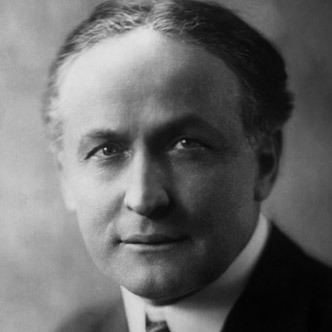 Houdini refused to seek medical help and continued to travel, eventually succumbing to periotonitis on October 24, 1926 at the age of 52.